According to Reuters, the Sakhalin II LNG plant in Russia has launched a tender to sell four cargoes of LNG between September and October 2016. 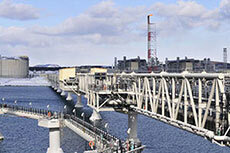 The export plant is joint venture (JV) operated by Sakhalin Energy. Gazprom owns a 50% stake, whilst Royal Dutch Shell, Japan Mitsui and Diamond Gas – a subsidiary of Mitsubishi Corp. – own 27.5%, 12.5% and 10%, respectively. Reuters reports that one of the cargoes will be loaded in October, whilst the first three will be loaded in September. Following an announcement in early 2016 that a technical fault had disrupted operations on the Sakhalin-2 LNG plant in Russia, the facility has now fully resumed production. Reuters reports that maintenance work on the Sakhalin-2 LNG plant in Russia is expected to last until March 2016. Representatives from Gazprom and Shell recently met to discuss a number of issues related to the strategic cooperation between the two companies. Reports suggest that Sakhalin II aims to export 18 LNG cargoes by 2018 by selling 6 cargoes per year from 2016.